BlytheLife.com » In excess of…? What are you in excess of? Do you have too many hats for your dolls? Too many pairs of shoes? (Wait, no one can ever have too many shoes, right?) Maybe you hoard every single doll’s stock pieces and never put them on anyone? What do you have too much of in your dolls’ wardrobes? 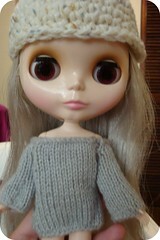 When I first started in the Blythe hobby, I had one Blythe doll and just the clothes that she came with. She wore her stock outfit for a few weeks before I broke out the knitting needles and made her a little sweater and then crocheted her a hat from some leftover yarn that I had lying around. Just over a year later, I have 6 dolls, 6 dolls worth of stock, a bag of shoes that I bought from a closet clean out, some Skipper outfits, some great clothes I got from organized group swaps and some clothes from a few dress designers. This is probably because it’s my go-to project when I’m feeling like crafting something for Blythe. I’m a big fan of making the little crocheted helmets for my dolls and, as a consequence, I now have upwards of 30 of them. They also used to all fit neatly into a little cardboard box that I had for them, the lid no longer goes onto the box and stays closed. But I love making them, I like coming up with ears to put onto them, or different designs or what to embroider onto the surface of the hats. I like testing out different yarns – I was trying out a new yarn and wanted to try felting it, so I made a Blythe hate and felted it. I find Blythe hats to be relatively quick to make up and then it’s sort of like a not-quite-instant gratification. 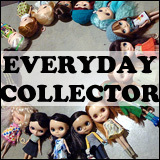 What do you have an excessive amount of for your dolls (or do you have an excessive amount of dolls)? Did you make all of them or did you buy all of them? 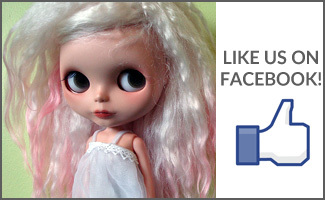 QOTW: How has Blythe taken over your life? 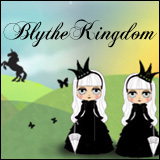 Question of the Week: LBB (Life Before Blythe)? I have sooooooo many shoes!!! With TWINS I’ve begun to order things in sets of 2…so I have double of just about every shoe. The other Blythes steal them from the TWINS from time to time…but goodness…sooooo many tiny shoes!!!!! Takara wingtips. I hoarded them for a while but they don’t all get used, so it may be clean out time soon. Right now I’m feeling like I don’t have enough clothes or dolls. I think hats… I have a lot of hats I’ve made or received in swaps. Also have a lot of prototypes that are a little off that don’t get worn too much. They’re either too snug-don’t close properly or a little on the crooked side… or just unfinished, need snaps or velcro or embellishment.